Often Ray would sit and wonder. "What is this cloud I am under? "But today, as he wokehe had a different thought,for it was the answers that he sought:"What is the key to being happy? 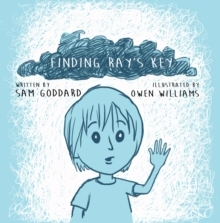 "`Finding Ray's Key' is a beautifully simple illustrated rhyming story for children, with a universal message that can be appreciated by all - young or old. The story's young protagonist, Ray (who often feels quite blue), wonders; `What is the key to being happy?'. He one day decides to go on a journey to find this key - and is surprised to find that it is `within him and all around'. The story is underpinned by Reiki and Mindfulness teaching - readers need not be familiar with this, but this aspect can be an invitation to discover more and will be recognisable by anyone familiar with Reiki.